Do You Believe We Came From Monkeys? Discussion in 'Science and Technology' started by Ima Cat, Apr 24, 2017. To suggest that ID/creationism is not the same entity is just dishonest. The Kitzmiller case was just one of many that resulted in ID/creationism being a false label for christian fundies attempting to force their dogma into the public schools. Here's a list of ten cases where you ID/creationists (fundie Christians), have suffered humiliating losses in their attempts to force your dogma upon the public schools. It’s curious that you would link to the Discovery Institute in an attempt to dissuade anyone that ID / creationism is not the same entity. It was Michael Behe who was a witness at the Kitzmiller trial and Behe is a “fellow” at the Discovery Institute. For anyone who may be unfamiliar with the background of Michael Behe, here are a few pointers. Among others of the fundamentalist Christian ministries, Behe also fronts for The Discovery Institute. They are a fundie Christian driven ministry promoting a stripped down and camouflaged version of Creationism called Intelligent Design. This "stealth christianity" approach was configured for legal reasons in the US, where public, state run schools are not allowed to promote religion. As many are probably aware, creationism and the later re-titled "Creation Science" are nothing more than configurations of fundie Christian ministries which suffered humiliating defeats in the court system as their veiled agenda of promoting religious dogma was ruled as such in the courts to be religion, not scientific doctrines. Creationist tactics rest upon one overriding pillar of faith, and that is: evolution is Atheistic and the whole political crusade being waged is one of Christians versus Atheists. We see this routinely in this thread where the fundies use Christian creationist slogans such as "atheistic evolutionist" assigned to anyone who accepts the science conclusions as opposed to Christian dogma. This dynamic requires mentioning because there are two reasons Creationists adopt this tactic. First, all the hysteria that is framed by fundies as a conflict being waged to defend christianity is thought to be effective as a means to recruit and retain fundie Christians to "the cause". Note that this is a recruiting tactic employed by other groups that plead conspiracy theories. Secondly the conflict is manipulated by fundies to divert the debate away from creationism is nothing more than literalist christianity to the more conspiracy driven "Atheist versus Christian" issues. This is the latest tactic Christian ID/creationists have employed believing that by framing their crusade in terms they hope will garner pity, they have a greater chance of obtaining religious support. It is not dishonest like the Piltdown Man and the Archaeoraptor fraud. This is why creation science didn't want it to be based on ID. Creation science believes that the school argument is over separation of church and state. It has nothing to do with the differences in the scientific beliefs which has been discussed in this thread and I think that the creation side has the observable, testable and falsifiable science. .While there is intelligence behind God's creations the argument put forth should not be that it's due to design principles. ID has nothing to do with the differences in the scientific arguments. Thus, creationists continue to fight for another trial so that they will better able to teach creation science in public schools. It won't be based on religion. The true test will be how the creation science curriculum and text is presented. The other part which you continue to ignore are the rebuttals to your belief that creation science is based on faith. To the contrary, evolution is the science that is more based on faith. That's why it's dangerous. Some of the mutations that evo scientists think is safe aren't. They will cause great harm and it has already shortened people's lives. I posted that chart on evolution and the common ancestor hypothesis is practically all based on connecting the dots that we came to be by common ancestor. Thus, we must have monkeys as ancestor or birds must have come from dinosaurs. The evidence does not show that, but atheist scientists do not have any arguments presented against them. That's not the way I learned science. Science was always about serious disagreements and how life and our environment came to be. The widespread belief that there are common ancestors is not true. Otherwise, we would be able to observe, test and falsify it. What the au. afarensis and other australophicines probably were chimpanzee variants, possibly a chimp-gorilla hybrid. 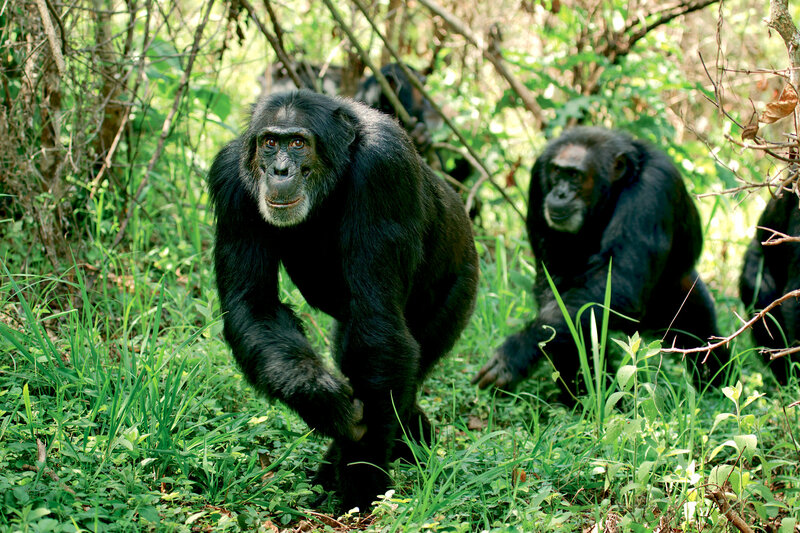 People who live in Africa are familiar with chimpanzee variants. They are larger than a chimpanzee and have parts of their skull like that of a gorilla. I admit the chimp-gorilla hybrid is more difficult to prove it exists since their mating is different. The articles on the bili apes were difficult to get. Many of them assume that they're chimp variants and do not connect to the gorilla. What it shows is a different path from monkeys becoming humans. This goes against evolution, so to connect chimpanzees to gorillas would defeat the argument that chimps became ape-humans. There is the forbidden science of humanzees, but those creatures didn't last for more than one generation. I think you make several errors which need to be addressed. Yes, both Piltdown Man and the Archaeoraptor were errors made by greedy individuals but as it was pointed out earlier, those errors were discovered and remedied by scientists. It was actually a remarkable demonstration of the process of science correcting and adjusting. You are free to deny it but the reality is that the Theory of Evolution is among the most accepted and well documented theories in science. It should be pointed out that Darwin’s "Origin of Species" accomplished two very different things. First:, it demonstrated through a catalog of scientific detail the historical fact of evolution (assuming an understanding of the difference between levels of scientific certainty and the theories that explain them). Using fields as diverse as biology, comparative anatomy,selective breeding, geography and animal behavior, Darwin laid out the evidence and formed a working theory that evolution (descent with modification) had actually occurred. His evidence was overwhelming. Within little more than a decade after his theory was published, most of the leading biologists of his day were convinced that evolution (descent with modification) was true. Secondly, Darwin proposed a theory for explaining what we would learn to be fact: "Natural Selection." This, of course, is contrary to the claim by ID/ creationists that supernaturalism is the as a way to explain the diversity of life on the planet, (completely unsupported and it assumes the requirement for supernaturalism), Natural Selection makes no such requirement and makes no requirement for coincidence or magic. Evolution instead defines the objective criterion of "reproductive fitness" as the completely natural mechanism for driving biological change. Regarding your comment that ID/creationists “fight for another trial”, that simply isn’t true. Kitzmiller vs. Dover served as yet another humiliating loss for those looking to force religion into the public school system. There has been no concerted effort by any of the ID/ creation ministries to attempt another trial. In every instance, every single one, the UD/creation ministries have been handed humiliating losses. I gave you a roll call earlier to demonstrate that. You make an error in claiming that there is a requirement for belief in science. That simply isn’t true. The force of gravity, electromagnetism are forces we cannot directly observe, yet, there is no requirement for faith to perceive the existence of those forces. What we do know with certainty is that every discovery in the history of mankind has had a natural causation. I have no requirement for faith or belief supernaturalism to accept the "naturalistic" explanation of life. Every discovery in the history of science has had a naturalistic explanation, even those that were formerly thought to have a supernatural cause. I see no reason why the evolution of life should be any different. Should the subtle and complex formulas of calculus cause us to deduce an intelligent designer of mathematics? I have no faith in math. I have no faith in chemistry, or geology, or astronomy. Things are as they are. If you have evidence of any phenomenon that has a supernatural cause, please identify it. You make the statement “evolution is the science that is more based on faith”. There is no requirement for faith. This was addressed earlier. The Theory of Evolution is among the best supported in science. It really is difficult to believe that you can seriously suggest that there is some global conspiracy of scientists, universities, colleges and a history of learning that has progressed since the Dark Ages. Here's a specific evolutionary fact: It is a fact that there is genetic variation within species. It is a fact that this genetic variation is passed on. That, essentially, is evolution. It is a fact that the earth is billions of years old, and that the oldest known microfossil is 3.8 billion years old. That leaves a lot of time for genetic variation to be shaped by selective pressures. It also tends to confound your requirement for supernatural creation. Instead of spouting vague, unsupported claims about conspiracy theories in the science realm, why don't you state some specifics? What, specifically are the conspiracies that you believe are being furthered by those horrible Darwinists and Evilutionists? You’re kidding with Eugene McCarthy, right? Even if you’re not kidding, lie to me and tell me you’re kidding. Heh. ToE is only accepted because the opposition has been systematically eliminated, but what I have been saying just sails over your head. Look, I pointed out that fraud had to be committed in order for people to believe in macroevolution. Both cases! Macro does not happen. How many times do I have to repeat it? The creation scientists are the ones whose evidence destroys monkeys to man and dinosaurs to birds. It's not creation scientists who made errors and committed fraud. It's the evo scientists. They've made so many errors, but you just let it slide. Talk about believing in myths and superstitions. It's no wonder that atheists and atheist scientists are usually wrong. I think you can't demonstrate humans from monkeys and birds from dinosaurs, so you keep going off the subject. There is plenty to discuss just on why humans from monkeys fails. None of my claims are unsupported. I have provided the links to back it up. They were made by evolution scientists, too. I'm not sure what you are afraid of because anyone with an open mind would realize that evolution is BS. It just so happens that the powers that be want you to believe it so the general public's lives can be cut short. Talk about crackpots, you didn't even read the link. There are other vids of chimpanzee variants. If any of them were going to become human, then we'd have the science fiction movie Planet of the Apes. Macroevolution is science fiction. I can't believe the atheists here cannot tell the difference. Hell, I cannot believe that any person of more than room temperature IQ could accept the nonsense that you spout. Ah well, people like you don't count in science, in any case. BTW the answers are 02:78, for the division. And 56:25 for the multiplication. This is sexagesimal math. That is outrageous for us today to understand. But it was the first math. And it was taught to the Sumerians by the Anunnaki. And we still use it today, but we don't make calculations based on it. For instance, what is 3 minutes and 30 seconds, times 2 minutes and 30 seconds? We understand adding them together, but not multiplying or dividing them. It's a totally different concept than the easy decimal version we use today. So for the first human civilization to choose to use sexagesimal, and invent math and science and writing, is a little weird. Unless, as they said, they were taught. And who taught them? The Anunnaki. "Those who from Heaven to Earth Came"
And everything since, is plagiarism based on the original Sumerian (and Assyrian/Babylonian) writings. FYI, the answer is 8 hours and 45 minutes. Figure it out... It makes no sense, but is correct. Use your watch or clock and thank the Sumerians for the sexagesimal counting system, and thank god you don't have to multiply or divide with it. It just seems odd that you’re promoting conspiracy theories about evilutionists / atheist scientists but you somehow accept the crackpot notions of Eugene McCarthy. This is the result of a chimp mating with a pig, at least according to the ID/ creation quacks you define as heroes. The Theory of Hybidization according to Eugene McCarthy has some interesting outcomes. I finally looked up Eugene McCarthy. Was thinking someone associated with McCarthyism. He was a Democrat and friend of Bill Clinton. Doesn't sound like a YEC creation science person to me.